Good and evil. Leader and follower. Layers. We contain multitudes. The conflicting forces within each of us are a puzzle and artist Lena Rushing happily presents us with the pieces in her latest exhibit, Bedlam. LIKE AN ONION: The series of nesting dolls show “different sections of the same person,” says artist Lena Rushing. 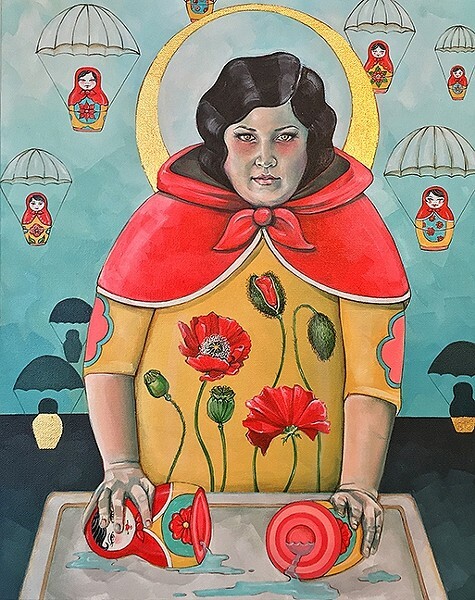 The different sections of the Grover Beach-based artist’s show (on display at Steynberg Gallery through Nov. 29) take us through it all with Rushing’s narrative work that often features powerful women. There’s the Bedlam character, a black and white, mischievous creature with owl ears that represents the catalyst of change for different events in our lives. While Bedlam is neither good nor bad, per se, his counterpart, the red Grudges, is more of a jerk—though they’re not quite the proverbial angel and devil sitting on each shoulder. THE SAINTS ARE COMING: Rather than focus on the negative this election season, Lena Rushing decided to saint her heroes Bernie Sanders, Jane Goodall, and Neil deGrasse Tyson. In the shadow box piece Balance of Power, two carefully crafted paper Bedlams grasp a crown with a swarm of bees flying out of it. Rushing used bees throughout the show to symbolize how we adhere to the hive mentality, or what’s considered socially acceptable. Brightly colored paintings of nesting dolls (with a smaller and smaller person inside each consecutive doll) literally show the different sides to people. In the piece Insight, a woman that looks just like a life-sized nesting doll holds a nesting doll cut in half with water spilling out from its insides. A SHIFT: Lena Rushing’s character Bedlam, featured in the piece Balance of Power, represents the catalyst for different events in life. A crew of fierce ladies with peppermint candy cane patterned hair adorn another wall. 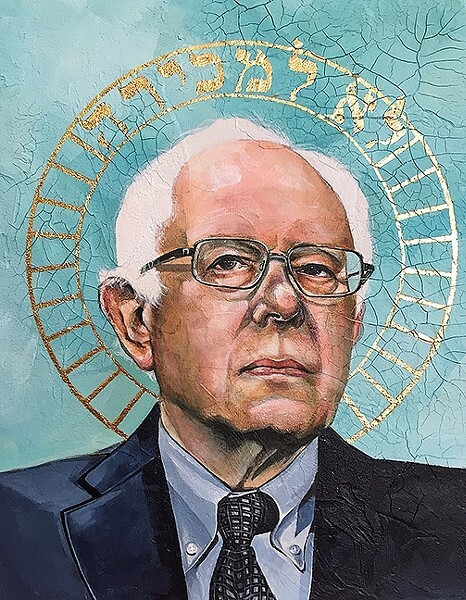 A trio of “saints,” namely Bernie Sanders, Jane Goodall, and Neil deGrasse Tyson wear halos, Rushing’s nod to the tumultuous political season without going negative. 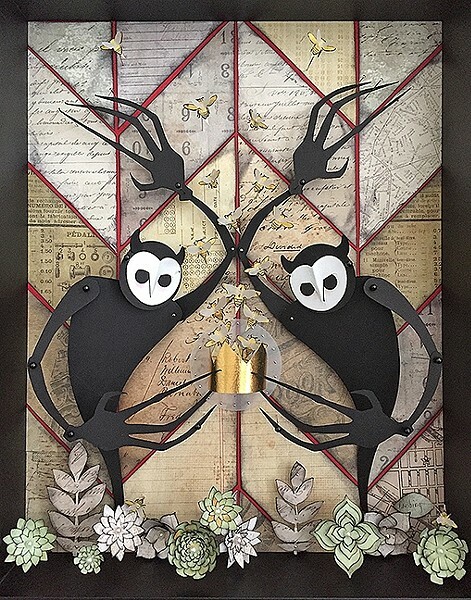 And finally, there’s a collection of cute owls (ranging from wearing flowers to a pope outfit) constructed from paper in shadowboxes because dang it, owls are cute. Still even with some fun eye candy thrown in for pure pleasure, Rushing’s Bedlam exhibit does enable the mind to wander endlessly. 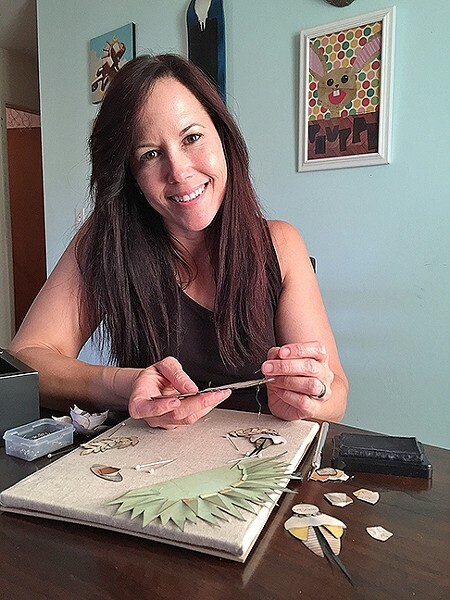 ARTIST AT WORK: Lena Rushing has created art in SLO County for the past 20 years. “I hope they see that most of the pieces are female forward, and I hope they’re a powerful, feminist force. I hope they inspire people to be creative because it’s unconventional, and I wish there was more unconventional art,” Rushing said. Lena Rushing’s Bedlam exhibit will be on display at Steynberg Gallery in SLO through Nov. 29. Pieces in the show are available for sale and range from $300 to $3,200. Visit lenarushing.com for more information. Ryah Cooley is a little bit of everything, all rolled into one at rcooley@newtimesslo.com.